Authors: Jorge A. Zavala, Alfredo Monta, David H. Hughes, et al. Disclaimer: For a different perspective on this paper, check out this later astrobite by Matthew Green. Some galaxies appear to be especially luminous in the infrared. In the local universe, these are called ultraluminous infrared galaxies, or ULIRGs. ULIRGs are thought to be very dusty and to form stars very quickly, producing hundreds of solar masses of stars per year (for reference, the Milky Way only forms about 1-5 solar masses of stars per year). Farther away in the universe, the infrared radiation produced by dust gets redshifted to longer wavelengths—often to sub-millimeter wavelengths (around 250 micrometers to 1 millimeter, somewhere between infrared and microwave radiation on the electromagnetic spectrum). Sub-millimeter galaxies (SMGs) are, unsurprisingly, galaxies that are identified by their sub-millimeter radiation. These SMGs are observed at high redshifts; in fact, a handful of SMGs have been observed at redshifts above 5, or before the universe was about a billion years old (recall that redshift is both a measure of distance from us and of time in the past). This brings us to today’s paper by Zavala et al., who try to answer these questions by reporting the discovery of a less-extreme high-redshift SMG. How do you see something far away that’s not very bright? That’s easy: magnify it! Fortunately, the universe offers a natural way to do that using gravitational lenses—massive objects (often galaxies or galaxy clusters) that, like traditional magnifying lenses, magnify background objects by bending the light from those objects. Figure 1. 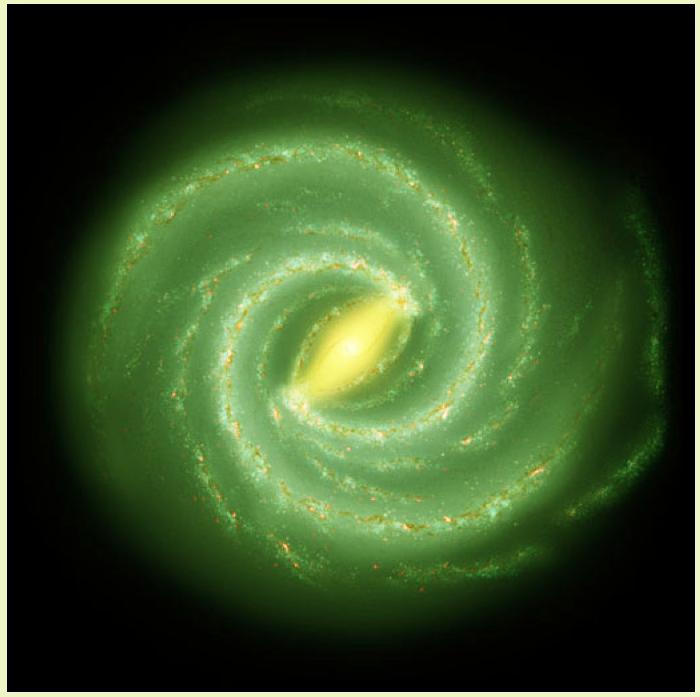 Left: an image of the foreground galaxy, observed in optical light (green) and the lensed background galaxy, observed at a submillimeter wavelength (red). Right: the modeled components of the lens system: foreground object in blue, background in orange. Note that the observation and model of the background galaxy match well. That’s exactly the mechanism that Zavala et al. use to find a high-redshift SMG. 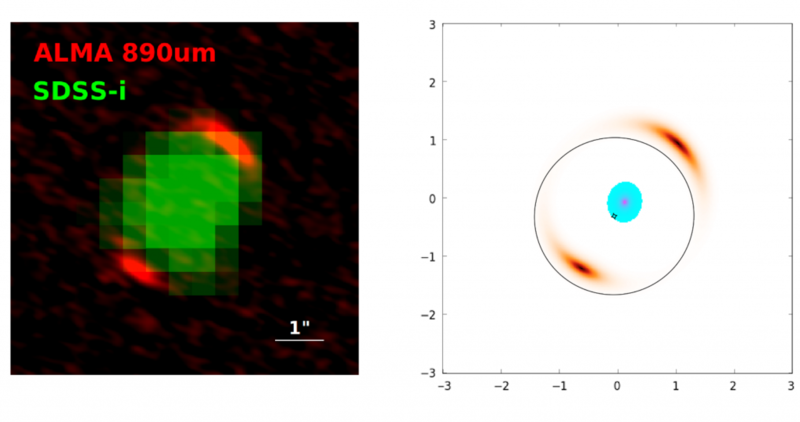 As shown in Figure 1, a nearby galaxy (green blob in the middle of the left panel) acts as a lens for a high-redshift SMG in the background (red arcs around the central blob). 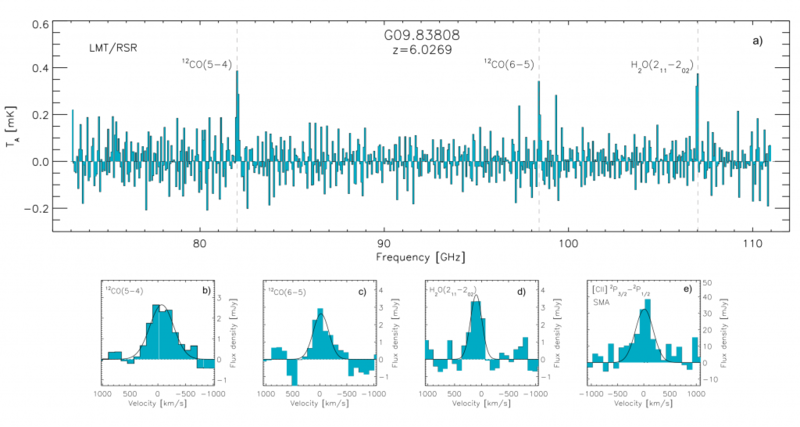 They are able to identify spectral lines for CO and H2O molecules in the spectrum of the background SMG (Figure 2), which allows them to precisely measure its redshift of approximately 6—when the universe was less than a billion years old. Figure 2. The spectrum of the background SMG (top panel a). Dashed vertical lines show the observed CO and H2O lines, shown in greater detail in panels b, c, and d. An additional [CII] line measured from a follow-up observation is shown in panel e. Teal histogram is the observed spectrum; black lines are best fit models. Zavala et al. then use this measured redshift to model the lens and the background SMG, and their model seems to match observations pretty well (right panel of Figure 1). From the model, the authors conclude that the light from the SMG has been amplified by a factor of almost 10. This is important—to get a true measure of the light produced by this SMG, the authors need to correct for how much the light was amplified by gravitational lensing. After they correct for the amplification due to lensing, the authors find that the SMG is producing about as much infrared light as a local ULIRG, on the order of 1012 solar luminosities. They use this infrared flux to estimate a star formation rate of approximately 380 solar masses per year, which is lower than the approximately 1000 solar masses per year formed in other high-redshift SMGs. Finally, the authors can use the CO spectral lines shown in Figure 1 to estimate how much molecular gas is in the galaxy, and they find that this galaxy lies right in between ULIRGs and SMGs when plotted on the relationship between gas and star formation rate (Figure 3). Figure 3. 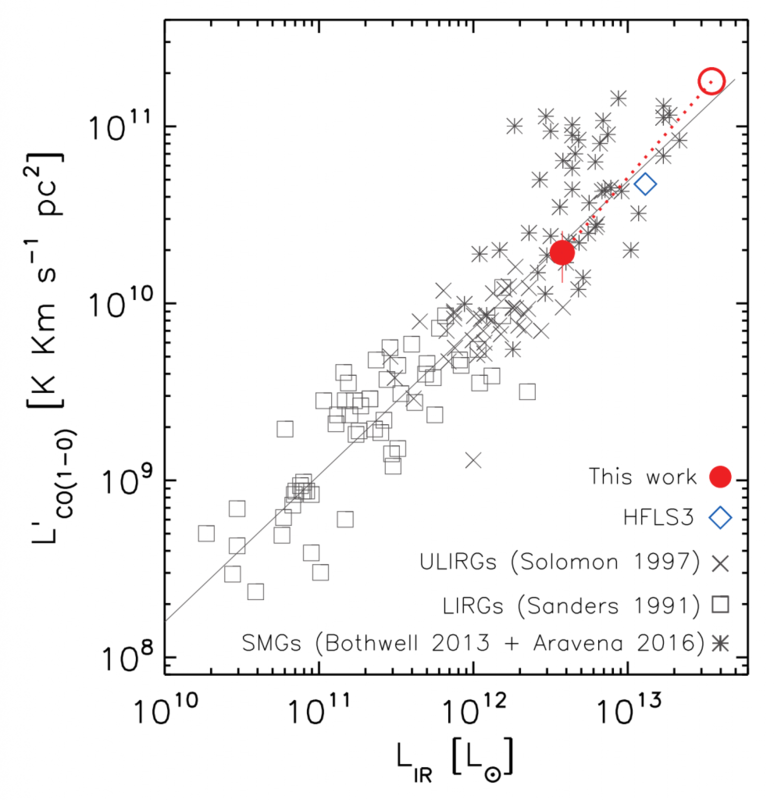 The relationship between star formation rate (traced by infrared luminosity on the x axis) and gas mass (traced by CO luminosity on the y axis). Local ULIRGs are shown with x’s (LIRGs, which are like ULIRGs but less luminous, are shown with squares), and SMGs are shown with asterisks. The blue diamond marks another SMG with redshift higher than 6. Red circles show the SMG reported in this work; the filled circle corrects for amplification from gravitational lensing, while the empty circle does not. The results presented in the last paragraph all depend heavily on the amplification factor from gravitational lensing (see, for instance, the difference between the filled and empty red circles in Figure 3). However, if the authors have correctly modeled the effects from lensing, all of these clues suggest that this high-redshift SMG may be less extreme than other high-redshift SMGs, and more like a ULIRG instead. Perhaps, as Zavala et al. suggest, such ULIRG-like SMGs are more representative of dusty star-forming galaxies at high redshifts. They could even be the ancestors of massive quiescent galaxies (galaxies that are not actively forming stars) at lower redshifts. More observations of similar galaxies are needed to check if this is the case. But if so, it could change how we think about galaxies in the early universe. After all, we’d never seen a galaxy quite like this before—and who knows what else could be out there? *Note that dust can also reprocess light from things other than star formation, like active galactic nuclei. However, the spatial distribution of dust emission seems to most closely trace star-forming areas within galaxies, suggesting that star formation accounts for most infrared light from dust. **This kind of effect is called a “selection effect” in astronomy. Selection effects almost always affect observations, just because it’s easier to observe things that are brighter/bigger/more obvious. So we always have to consider the possibility that what we see isn’t truly representative of what we’re trying to observe.